The Denver spine surgeons at Rocky Mountain Spine Clinic, P.C. are well respected physicians, not only in the medical community in this region, but across the country and internationally as well. They are highly trained, having come from some of the best medical schools in the United States. Doctor Jamrich, Doctor Madsen and Doctor Prusmack earned their degrees from Columbia University College of Physicians and Surgeons. Doctor Barker hails from the University of Oklahoma College of Medicine. 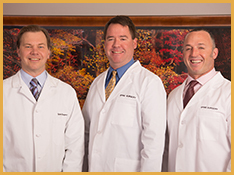 Doctor Jamrich, Doctor Madsen and Doctor Barker are Board Certified by the American Board of Orthopaedic Surgeons. Doctor Prusmack is Board Certified with the American Board of Neurosurgeons. Our physicians have extensive knowledge in the care and treatment of all spine conditions including congenital deformities, degenerative diseases, spinal tumors and spine trauma, both adult and pediatric. They are members of many of the professional spine societies including the North American Spine Society, the Scoliosis Research Society, the Cervical Spine Research Society, the American Academy of Orthopaedic Surgeons, the Miami Project, the American Association of Neurologic Surgeons and the Minimally Invasive Spine Society, as well as local and state medical societies. They continually strive to increase their knowledge of new advancements in their field by attending meetings and courses to learn the latest developments in spine care and surgery, including minimally invasive techniques and artificial disc replacement. 10.10.17: Mazor X treatment is now available at Rocky Mountain Spine Clinic. Dr. Madsen is one of the only spine surgeons using this advanced robotic technology. Learn about Mazor X.